Gov. Jerry Brown and U.S. 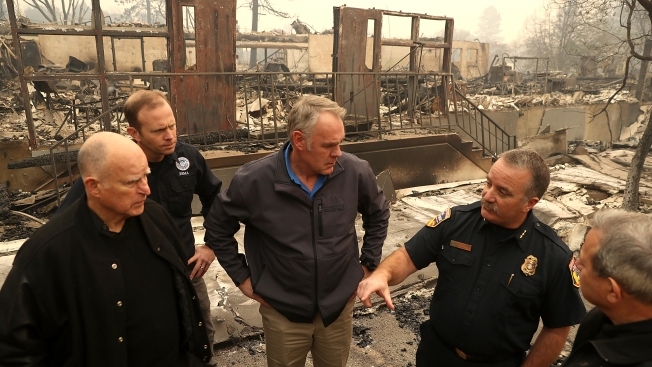 Interior Secretary Ryan Zinke visited the lines of the deadly Woolsey fire Thursday. President Trump told Brown that the federal government is prepared to assist the state in any way possible. Governor Brown says managing forests will cost tens of billions. Gov. Jerry Brown and U.S. Interior Secretary Ryan Zinke visited the lines of the deadly Woolsey fire Thursday, hailing the efforts of firefighters but saying better planning is needed in the future to prevent fires from growing into major disasters. "Fires, dryness, the lack of moisture, the heat, the winds at hurricane speeds -- so we have our work cut out for us," Brown told reporters after meeting with fire commanders. "It's so beautiful here, but having so many people living in this space, we are going to have to make a lot of changes." "... We're going to have to manage our forests better," he said. "We're [going to] have to build our cities more smartly. We're going to have to build shelters so people can escape when these terrible fires get out of hand. And yes, we're going to have to deal with climate change. All of that. Many elements. We've got to get on the side of nature. We can't just fight it and we do that in many ways. It will be expensive. We're not talking hundreds of millions, we're talking tens of billions for the whole state of California. But it can be done, with science, with research, with collaboration and with a lot of good will. We all pull together in solidarity, keeping California green, keeping it a wonderful place that we all love." Zinke echoed those comments, saying it is better to spend money on the front end on preventive measures than on the back end repairing extensive fire damage. "It's unsustainable and unacceptable that we have loss of life every year, that our firefighters are out there on the front lines risking their lives and we have local communities being ravaged," he said. "There's things we can do and we should do. We should look at the tree mortality. We should remove the dead and dying trees. We should prioritize around communities to make sure the fuel loads are reduced. "There's no silver bullet, but this problem didn't happen overnight," he said. "You can do prescribed burns late in the season. If you look at Yosemite National Park, we're collecting dead and dying trees, we're stacking them, returning the health of the forest and doing prescribed burns late in the season. We need some help from our state friends to make sure we do prescribed burns." 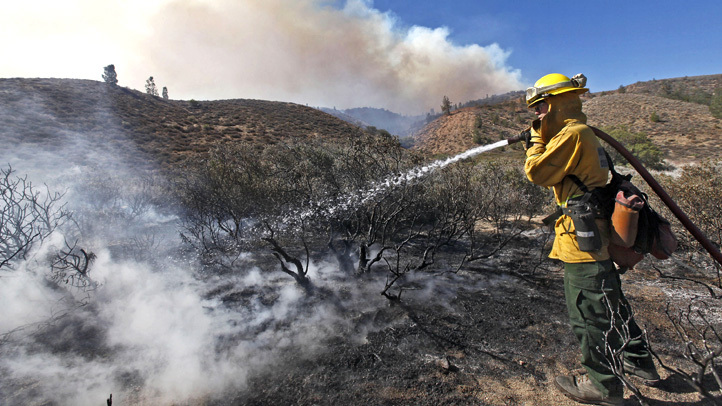 Brown stressed that there will always be fires, "and they're going to get more expensive." "Luckily, we are a rich state," he said. "But we've got to take intelligent precautions in how we design our cities. The zoning and the planning has to take into account the threat of fires. The building of appropriate shelters so people can always find a way to escape. And, of course, all the things we're doing to mitigate climate change." Brown noted that he spoke on the phone Wednesday with President Donald Trump, who offered him assurances that the federal government was prepared to assist the state in any way possible. The Democratic governor, who is normally at odds with the Republican president, insisted there is a mood of cooperation in the face of disaster. "Look, there's a lot of statements, a lot of loose rhetoric," he said. "But I think we're on the right path right now. We can all work together."